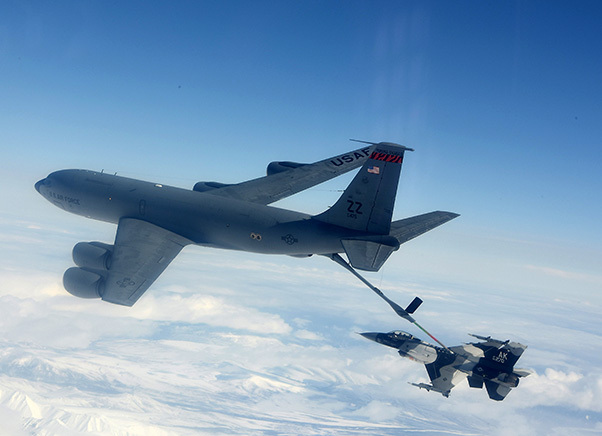 A U.S. Air Force KC-135R Stratotanker assigned to the 909th Air Refueling Squadron based at Kadena Air Base, Japan, moves into position to refuel an F-16 Fighting Falcon assigned to the 18th Aggressor Squadron (AGRS) from Eielson Air Force Base, Alaska, May 2, 2018. 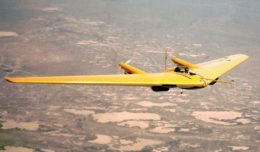 The 18 AGRS were participating in a training sortie during which they replicate enemy forces’ tactics, techniques and procedures. 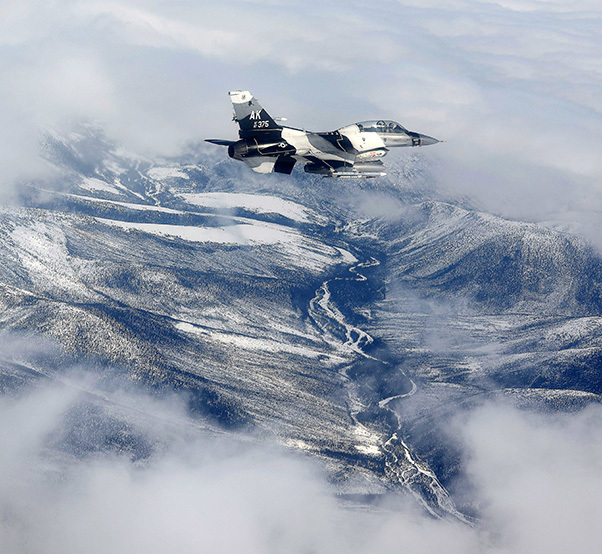 A U.S. Air Force F-16 Fighting Falcon aircraft assigned to the 18th Aggressor Squadron at Eielson Air Force Base, Alaska flies over the Joint Pacific Alaska Range Complex May 2, 2018. RED FLAG-Alaska serves as an ideal platform for international engagement enabling all involved to exchange tactics, techniques and procedures while improving interoperability. 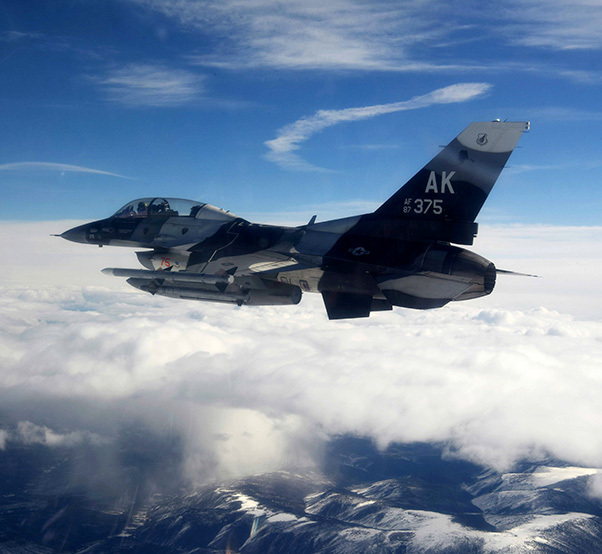 A U.S. Air Force F-16 Fighting Falcon aircraft assigned to the 18th Aggressor Squadron at Eielson Air Force Base, Alaska flies over the Joint Pacific Alaska Range Complex May 2, 2018. The 354th Fighter Wing is currently hosting the first of four RED FLAG-Alaska exercises this year. In this iteration we have assets and personnel from more than a dozen units and two of our sister services participating. 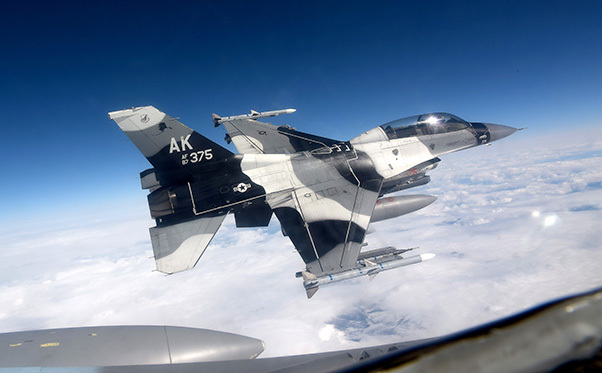 A U.S. Air Force F-16 Fighting Falcon aircraft assigned to the 18th Aggressor Squadron (AGRS) at Eielson Air Force Base, Alaska flies over the Joint Pacific Alaska Range Complex May 2, 2018. RED FLAG-Alaska is a joint, multi-national exercise hosted several times a year and serves as an opportunity for joint and multi-national units to train with the 18 AGRS. A U.S. Air Force KC-135R Stratotanker assigned to the 909th Air Refueling Squadron based at Kadena Air Base, Japan, refuels an F-16 Fighting Falcon aircraft assigned to the 18th Aggressor Squadron from Eielson Air Force Base, Alaska May 2, 2018. 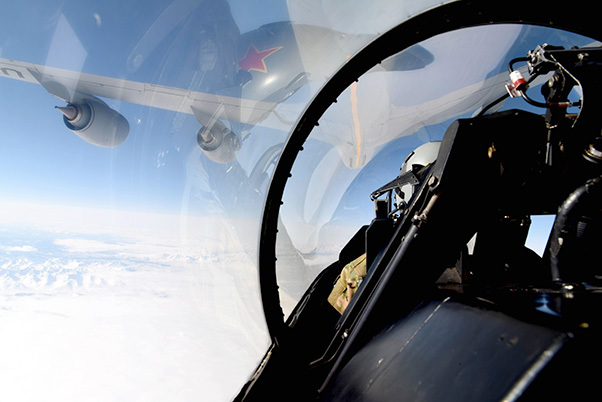 The aircraft were participating in a training sortie as part of RED FLAG-Alaska 18-1 which takes place in the skies over the Joint Pacific Alaska Range Complex in Interior Alaska.